Are you a WAHM (Work-At-Home-Mom) with 1-3 years of exprience and want to apply for SEO jobs? Now is the best time for you to learn SEO techniques to help you get more job opportunities by joining SEO for WAHMS, happening on June 30, 2018, 9am to 5pm at SkyLounge, 48 UnionBank Plaza, Meralco Avenue Corner Onyx and Sapphire Roads, Ortigas Center, Pasig City. SEO (Search Engine Optimization) is about making improvements to your website, so that search engines like Google have an easier time finding it which in turn will help you gain traffic. In this modernized world we live in where almost all of the brands and companies have their own website, only few can really understand how they can maximize the use of internet for their business. That is why a lot of them, local and international companies hire a virtual assistant who is knowledgeable in doing Search Engine Optimization. With this comes great opportunity for those who wants to work at home. 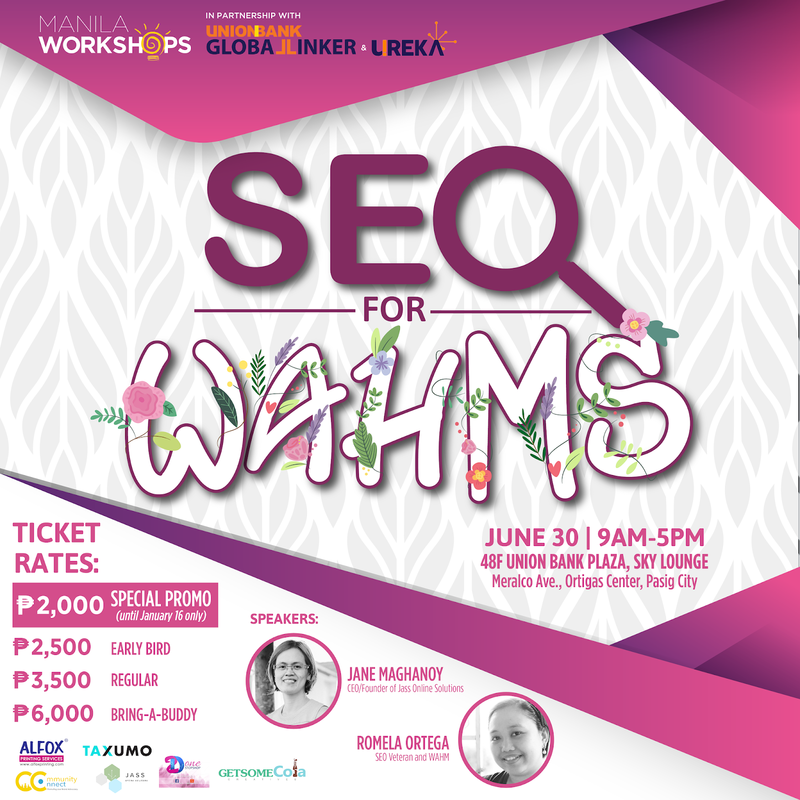 After paying via bank deposit, email a scanned copy of the validated transaction/deposit slip to veni.anabo@manilaworkshops.com. Please indicate the training you signed up for and the name you used during registration.